Tracks of a fisher on the hunt. We’ve had a bit of a January thaw this week, a good time for a fresh air hike along the road. Also a good time to see how many of my neighbours in the woods have also been on the move. The muddy shoulders by the pavement tell all. So I see the deer have been busy at the corner they seem to favour near the house. Since they gambol there at night, I can never see them in the dark but they seem to like the wide, shallow ditch and hop over the page wire pasture fence with no trouble at all. They have caused more than one car to swerve wildly or go in the ditch when they suddenly loom in the headlights. A couple of years ago, there was a high speed collision at the dark, requiring fire truck, ambulance and towing for the battered vehicle. Needless to say, there wasn’t much left of the deer except a major stain on the asphalt that took two rainstorms to erase. Deer cross the road lightly. The foxes and coyotes like to trot along the road also, especially at night. After the county goes to bed, the road can go for hours without a single vehicle. You can see where they have made periodic excursions into the brush to check out possible snacks before returning to their convenient human-made trail. Last year, I used to look out and see a fox that had a regular schedule, setting out down the road in one direction and often returning later with a rabbit or squirrel as her prize. A mother dutifully bringing home dinner for a den of hungry cubs. 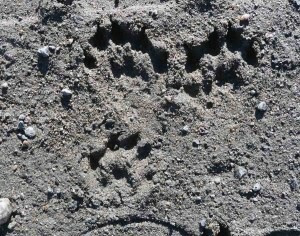 When there’s a warm spell, it is not unusual to spot raccoon tracks out to supplement their diet if they can. Raccoons don’t actually hibernate, like bears, but can sleep in their dens for weeks during very cold weather, living on the fat they worked so hard to store up in summer and fall. I was surprised to learn that a lot of fat builds up in their tail which wraps around them as they sleep to keep them warm. On milder days, they venture out to look for acorns, frozen berries, corn left in the field and even a field mouse or two if they can catch it. So adorable looking but they can fight off a wolf in battle. A fisher, in case you were wondering. Almost obliterated by tires, I see the paw prints of one of our fiercer hunters, the fisher. The fisher is large member of the weasel family that hunts snowshoe hares and other small mammals. It is one of the few predators that can kill a porcupine. Farmers in the neighbourhood claim all their barn cats disappear once a fisher arrives. The fisher is one of the reasons my kitties, much as they hate it, have to stay inside. The other reasons are coyotes, foxes, mink, large hawks and the road. Most everywhere, I see the tracks of crows who seem to like to strut along the road shoulders while they carry out raucous conversations with each other. They are interested in road kill, however small, and are so canny about traffic that you never see a dead crow by the roadside. This is not true for their relatives, the ravens who have have been showing periodically in recent years. You can tell them from their deep, hoarse croaks and heavy beaks. Perhaps they have not learned so much about cars in their northern homes and don’t know when to jump fast when they visit us in the south. Now I’ve added my own tracks to the mix. Good to know I’m just another of the locals frequenting this particular mile of road. Coyotes and foxes use the road as a night time highway.